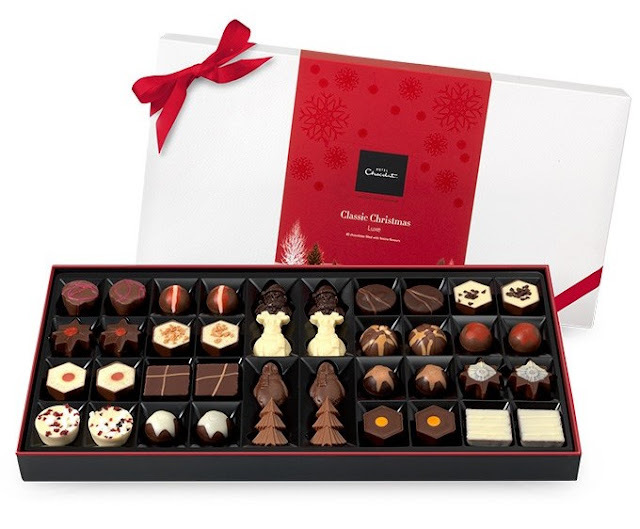 My second Christmas giveaway is a deluxe box of chocolates from those amazing folks at Hotel Chocolat. You've not tasted chocolate until you've tasted their chocolate! This one is The Classic Christmas Luxe and sells for £35. It contains a really exciting mix of chocolates. Gingerbread Praline - A festive icon: ultra-smooth pecan praline with ginger, cinnamon and nutmeg Christmas spices. Christmas Cake - The flavours of Christmas cake in a chocolate with cranberries and golden raisins with festive spices. Mince Pie Brownie - Brownie meets mince pie. Golden raisins, festive spices, chopped pecans, mellow milk. Christmas Mess - Eton Mess, given a festive make-over. Subtle cinnamon with cranberry white. Mulled Wine - It is what is says on the box! I recommend starting with the Caramel Tree. Hotel Chocolat does amazing caramel chocolate. It's so creamy and tastes so good. I love it. Then move on to the Christmas Mess and the Billionaire's Shortbread. After that have the Rhubarb and Custard, then you can consider actually offering someone else a chocolate if you really feel you must! Leave a comment telling me which chocolate you would eat first and if you would share, then enter via the rafflecopter box. You'll find a few more opportunities for extra entries there too. 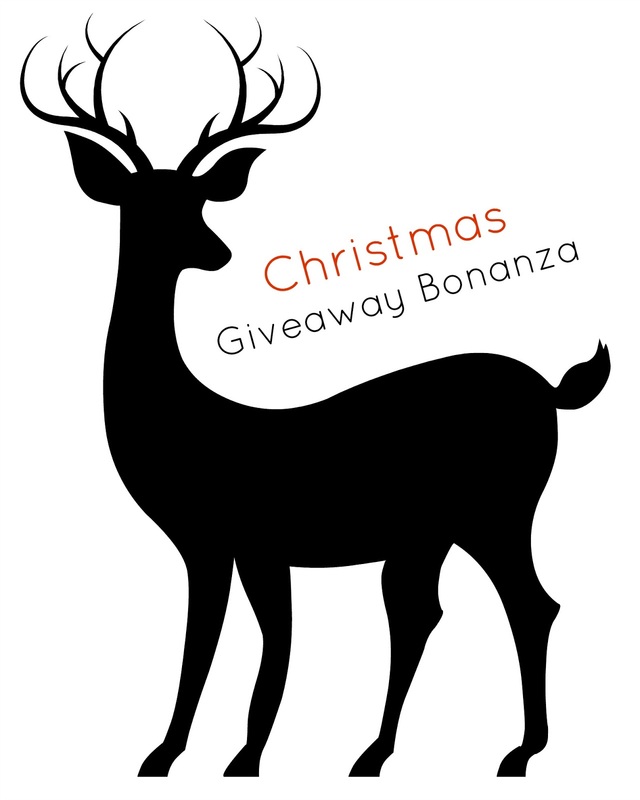 This giveaway closes on 22 December 2015 and is open to UK residents only. ps look out for my other Christmas giveaways, there are some great prizes. Cherry deluxe - I would hide them and ration them! Would do a little sharing as it is caring! I would start with the cute penguin, and I'd definitely share with my family as I've been dieting since Aug & lost 2 and a half stone so I wouldn't want to spoil it. I wouldn't eat any I would give them to my hubby for Christmas. I would eat the billionaire's shortbread first - rich and decadent. I would share my good fortune - it is Christmas after all! Nutmeg Almond Milk Praline sounds like a good place to start, and of course I'd share...... but only the ones I don't want! Ooh delicious! I'd eat them all at once and not regret a thing! Caramel Chocolate Pot. I'd share with my partner. Rhubarb and Custard sounds fab, I would eat that first. Of course I would share it with my husband, we both love chocolate. I would start on the Apple Strudel! Caramel chocolate pot for me. Yes I would share with my husband but kids might not get a look in! Lol! Billionaire's Shortbread - yum! yes i would have to share with my husband and kids! Gingerbread Praline would be my first choice! Christmas Cake chocolate! I love the flavours of Christmas, and I'm a big fan of Christmas cake. =D I would share, though, I'm pretty good about that! The Cherry Deluxe, I love anything with amaretto cream in, I would probably have to be guilt tripped into sharing! I would try the caramelised orange first and I would share them with my family. Tiramisu for me!! I might share these with other grown ups but they look far too good to waste on the kids - It's quantity over quality for them!! I'd eat the White Chocolate Reindeer first! I'd share them with my lovely mum! Gingerbread praline and Yes I would def. share with my husband. He loves chocolate more. Rhubarb and custard!! I'd share with my family! Mince Pie Brownie and I would share with my family. The Gingerbread Praline is tempting my tastebuds and I would share with my bestie. I would definitely share, but the caramelized orange one would be all mine, and first into my mouth. 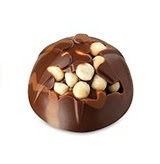 Gianduja 70% Bombe - once these had been scoffed, I may share the rest! 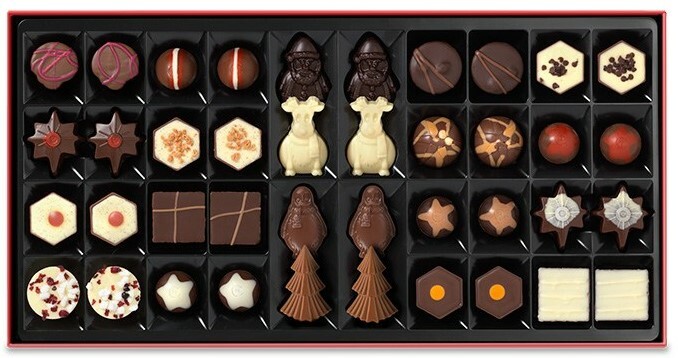 I would eat the 70% Santa first (actually both of them) because I love dark chocolate so I wouldn't share them but I'd be happy to share the rest of the box. Mince Pie Brownie! WOW. Christmassy or What! I would eat the billionaire's shortbread first and I would share with my good friends Volodimir and Inna from the Ukraine. I'd eat the brandy butter one first, and of course I'd share the rest! I would start with the Caramel Chocolate Pot - and I would share the ones I don't like, haha! Caramel trees for me and yes I would share them. I'm not greedy! Oh I'd definitely eat the tiramisu first - it's my favourite dessert EVER! I would share but the Brandy Butter would be mine all mine! Caramelised Orange would be first choice to share with my husband of 50 years - deserves a medal but sure he would prefer this choccy treat! Gingerbread praline, Christmas in a mouthful yum! I would share with the OH! Id eat the Gingerbread Praline first and share the Mince Pie brownie! Apple strudel. And I want to think I'd share them but after I'd eaten the first one I'd probably hide the box from everyone else. Eton Mess and its not if I'd share, its more would they be shared with me? Oh, the gingerbread praline for sure! Gingerbread Praline because it sounds so delicious and festive. I might let the kids have 1 or 2....If they're quick! I'd go for the tiramisu first and share the White chocolate reindeer which are hubbie's favourites! Maybe the white chocolate reindeer but that would be an extremely difficult choice. And I'd let my hubby have any dark chocolates but otherwise I think I'd hide away with them! I would eat the Billionaire’s Shortbread first and I would share with my hubby. Apple strudel would be my first choice - and of course I'd share!! I would eat the Billionaire’s Shortbread first and yes I would share - the one I don't like! I would eat the Billionaires Shortbread first! I would definitely share! the Caramel Trees would be my first choice quickly followed by the rest! I would share with my Wife. apple strudel and yes of course i would share! I would eat the Caramelised Orange, and I would share it with my partner! I'd go for the Christmas Mess first, and yes I'd share them with my family. I would eat the Billionaire's Shortbread first and maybe share one or two! Christmas mess, it sounds divine. I would have to share , my daughter loves them as much as I do. Tough choice but I would have to pick the Nutmeg Almond Milk Praline and may appear greedy but no sharing! Caramel chocolate pot and I would only share the ones I didn't like!!! hahaha! Caramalised Orange and White Reindeer, and yes I would share. Luckily we like different flavours, so we shouldn't squabble too much. Christmas mess sounds the best! I'd have to share but I'd try to save the best ones! Cherry Deluxe would be first, and of course I'd share - but only with my husband, they are way too good for children! I'd eat Gingerbread Praline first and I'd share with my sister! I would eat the going nuts first :) and of course I would share! 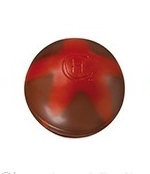 Gianduja 70% bombe, without a doubt! I would share them with my husband and he doesn't like dark or white chocolate, so I could have all the lovely bombes to myself! Caramelised Orange would be first! I may share a few with my OH & the kids but then I'd like to hide them away just for me!! Cherry Deluxe for me - cherries, tick; amaretto, tick; chocolate, tick!! I would have to share as there'd be too much guilt involved!! the Billionaire’s Shortbread and no way would I share! Caramel Chocolate Pot - sounds so delicious! I would definitely start with the White Reindeer, and I always share! I feel like saving the pictures of those chocolates as my desktop they look so good! rhubarb and custard interesting combo! The white reindeer would find it's way first in to my mouth! I would share them with my husband. It would have to be the Tiramisu first for me and sorry I could not share. They all sound lovely, but it would have to be the brandy butter one! Caramel Chocolate Pot, and I doubt I could share! The christmas mess and no I would not share!!! Rhubarb & custard sounds lovely, wld share any I cldnt manage with hubby! I'd eat the Caramelised Orange first and give away the Christmas Cake! The Tiramisu - then I'd let my family eat the rest, as I'm on a diet! 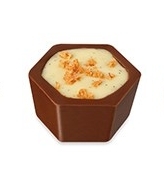 I'd love to try the Brandy butter chocolate first - it reminds me of my grandad making brandy butter when I was little :D I probably would share, but I'd have to be careful sharing with the kids, because they'd probably scoff them all in one go if they could! Christmas Mess, followed shortly by Gingerbread Praline and Cherry Deluxe. I do intend to share, but I have to put chox out of (my) sight for safekeeping, and then I forget them when we have company. Oops. I would eat the Billionaire’s Shortbread first and I would share with my husband. The Billionaire’s Shortbread. I wouldn't want to share but would probably end up doing so. I'd eat the Brandy Butter first... and of course I would share i'd never manage it all on my own!